Electrically Conductive Adhesives are generally applied for connecting electrical or electronic wires and circuits without impacting the conductivity in the circuit. There are various materials used as electrically conductive adhesives for instance, silicon, acrylate, polyurethane and others. Synthetic resins or combination of two varnishes can be used in a conductive component to such as nickel, copper, silver or graphite to balance the stickiness of the adhesives. These adhesives hold the capability of obstructing electromagnetic radiations that are radiated from electronic devices. The increasing demand for electrically conductive adhesives in aerospace industry and military purposes is expected to propel the market across the globe. The use of electrically conductive adhesives is high in automotive industries on the account of association of sophisticated electronic components that are liable to electromagnetic radiations emission. Thus, the uses of electrically conductive adhesives are extensive in electrical and electronic industries. 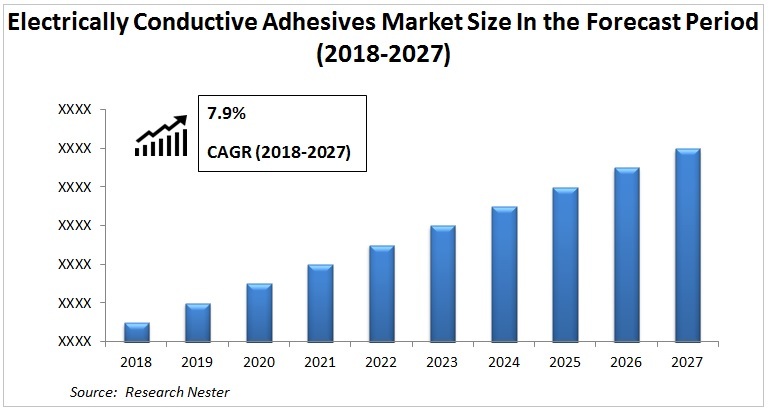 Additionally, application of devices that are technologically advanced has been gaining velocity in the past few years which is expected to increase the demand higher for electrically conductive adhesives market over the forecast period. Electrically Conductive Adhesives Market is anticipated to record a CAGR of 7.9% over the forecast period. The market is anticipated to value around USD 3.14 Billion at the end of the forecast period. Many multi-national companies are concentrating towards new product advances in electrically conductive adhesives. Moreover, the many advantageous properties of electrically conductive adhesives are exploited in the field of automotive and electronic industries now and then. New uses for electrically conductive adhesives are discovered on a regular basis which is expected to drive the electrically conductive adhesives market rapidly. Currently the global electrically conductive adhesives market is observing vibrant growth owing to increasing demand of technologically advanced electronic devices in the market. Advance in aerospace industry in the past few years and growing technological explorations is projected to drive electrically conductive adhesives market besides the wide range of functions of electrically conductive adhesives in an immense range of processes such as fixing printed circuit board, scanning electron microscopy, electromagnetic radiation obstruction and more during the forecast period. On the basis of regional platform, global Electrically Conductive Adhesives market is segmented into five major regions including North America, Europe, Asia Pacific, Latin America and Middle East & Africa region. As a home to a number of electronic industries, Asia-Pacific is panned to observe substantial electrically conductive adhesives market growth due to rising electrically conductive adhesives usage in countries such as Japan, China and India. North America follows Asia-Pacific in terms of consumption due to expanding electrically conductive adhesives applications in the military and aerospace sector. The rising demand for electrically conductive adhesives is on account of some of their superior properties that allow their applications in touch panel screens, LED/OLEDs and PV solar panels, and along with various other electronic devices. The use of electrically conductive adhesives in electrical circuit joining and increasing use of these adhesives in technologically advanced electronic devices on account of rising technological advancements is estimated to propel the electrically conductive adhesives market over the forecast period across the globe. The use of epoxy adhesives require less handling assemblies and faster production on account of shorter processing time which is expected to make it an attractive choice for the circuit manufacturers and thus, drive the market robustly during the forecast period. The use of electrically conductive adhesives has been gaining acceleration recently in the military and aerospace industry which is expected to expand the market further over the forecast period. These adhesives are also used in automotive sensor applications and for flexible displays and PCBs which adds on to the electrically conductive adhesives classical applications. However, cost constraints associated to these electrically conductive adhesives adds up to the overall manufacturing charges making the process expensive which is anticipated to behave as the key restraining factor in the growth of electrically conductive adhesives market during the forecast period.